If a local college gives a city planner tickets to a sold-out football game, is it wrong to take them — even if the planner pays? Should a planning consultant bid on a project that has a clearly unrealistic timeframe? Can a planning director moonlight for another agency? For practicing planners, potential ethics violations abound, and the eye of public scrutiny never blinks. Planners need a guide, and now they have it: the first guidebook based on the current revision of the AICP (American Institute of Certified Planners) Code of Ethics and Professional Conduct. 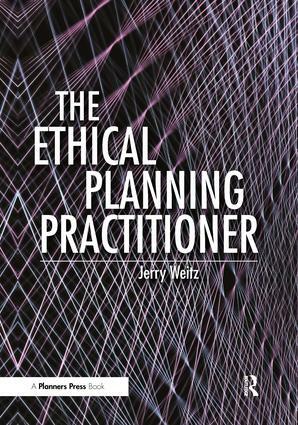 The Ethical Planning Practitioner presents 76scenarios, all real-life dilemmas based on the code’s rules of conduct. Each scenario comes with tools to help planners explore the answers on their own, in a training session, or in a classroom. When you buy the guide through APA, you get something more: a recording author Jerry Weitz, FAICP, made with former AICP President Dwight Merriam, FAICP. Together they review three short videos, talk about the ethical situations they represent, and suggest the actions planners could take. The recording comes with a PowerPoint presentation that makes it a powerful teaching aid. This vital handbook looks at everyday ethics the way planners need to see them, in black, white, and shades of gray — but most of all, clearly. The Ethical Practicing Planner will not only instruct but inspire planners to strengthen the public’s trust. "Weitz is masterful at discussing the nuances and subtleties of ethics in actual practice. This one volume is essential for any AICP member or aspirant." "This handbook is a resource that can be used again and again to learn, argue, and discuss. Rather than simple answers to ethical challenges, it gives us questions worth considering." "To be effective, planners need a good understanding of how to apply the AICP Code of Ethics in their day-to-day work. Thank you, Jerry, for a valuable tool for all of us!" Jerry Weitz, FAICP, is principal of a planning and development consulting firm based in the Atlanta area. From 2010 to 2015, he was director of the urban and regional planning program at East Carolina University in Greenville, North Carolina. In a career spanning more than three decades, he has worked with cities, counties, state agencies, planning consulting firms, developers, attorneys, nonprofits, citizen advocacy groups, and universities. The issues he has confronted bring real-life contexts and sure guidance to The Ethical Planning Practitioner.